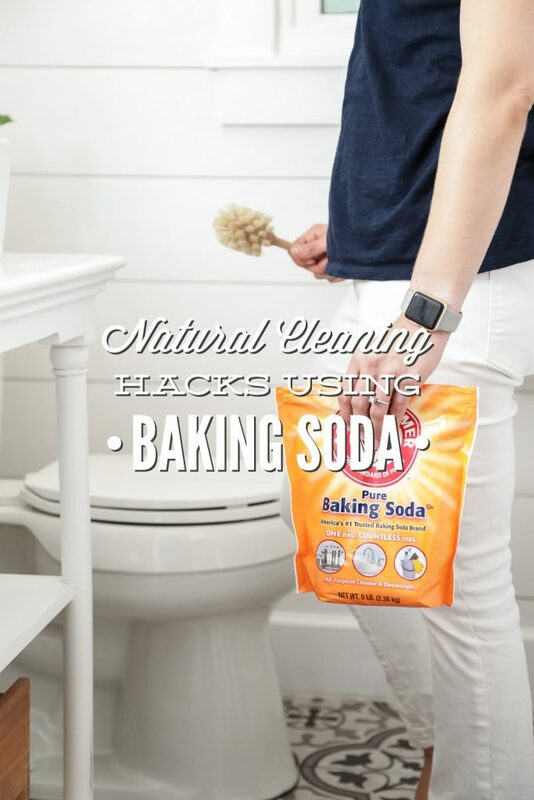 Baking soda is one of my favorite cleaning ingredients to keep in my cleaning caddy. The white powder can be used to clean, deodorize, and freshen a variety of areas and surfaces in my home. And the fact that a pound of baking soda costs less than a fancy latte, only adds to its appeal. Baking soda can be added to some homemade cleaners to boost the cleaning and deodorizing properties, but it can also be used by itself. On its own, baking soda is an impressive cleaning agent. 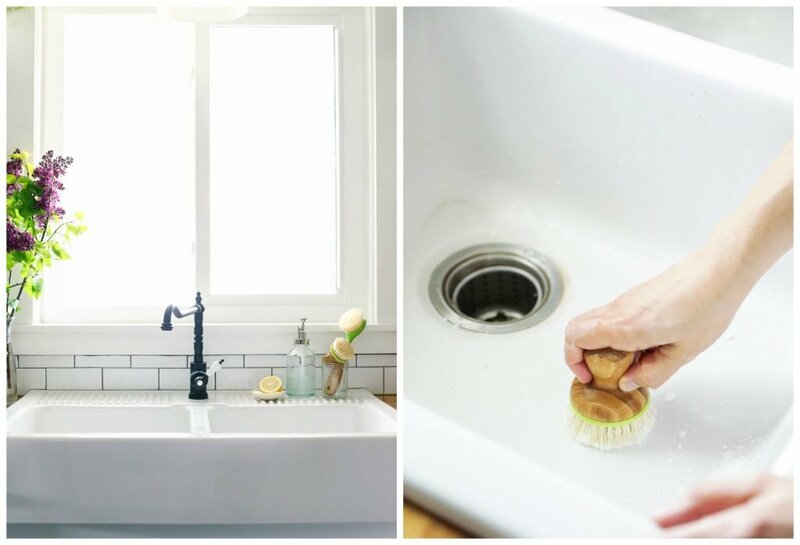 Today, let’s talk about my favorite cleaning hacks that only require this one powerhouse ingredient: baking soda. Sprinkle baking soda over the surface of a ceramic/porcelain sink. (I don’t have experience with other sink surfaces–always test a small area first.) Use a scrub brush or sponge to gently scrub the surface with the baking soda. I love watching the grease and dirt/food build-up magically disappear. Rinse the surface with clean water. If you’d like to add a fresh lemon scent, mix a few drops of lemon essential oil with the baking soda, and then follow the steps above. Sprinkle baking soda over the surface of a ceramic/porcelain bathtub and sink. Use a scrub brush or sponge to gently scrub the surface with the baking soda. As you scrub, the build-up that can occur on both surfaces will lift away, leaving behind a sparkly tub and sink. Between pets and kids, our carpets and rugs are subjected to all sorts of fun activities. 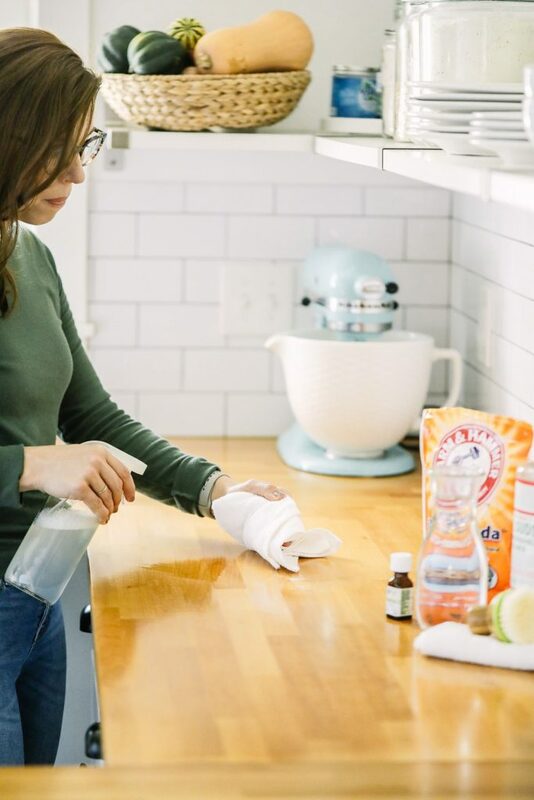 In order to keep these surfaces smelling fresh, I sprinkle them with baking soda (whisked with a few drops of a favorite essential oil, like lavender essential oil), wait 30 minutes, and then vacuum the surface. Lightly sprinkle baking soda onto an exposed mattress (no sheets), wait 30 minutes, and then use a hose attachment to vacuum the surface. Generously sprinkle baking soda onto pet bedding, wait 30 minutes, and then vacuum the bedding to remove the odor-neutralizing powder. Regularly cleaning the fridge helps take care of most odors, but just to be safe I like to keep a jar of baking soda in the fridge. This baking soda helps to neutralize odors and keep them from overtaking the fridge (and other foods). Combine baking soda (1 cup) and a few drops of lemon essential oil in a storage container. 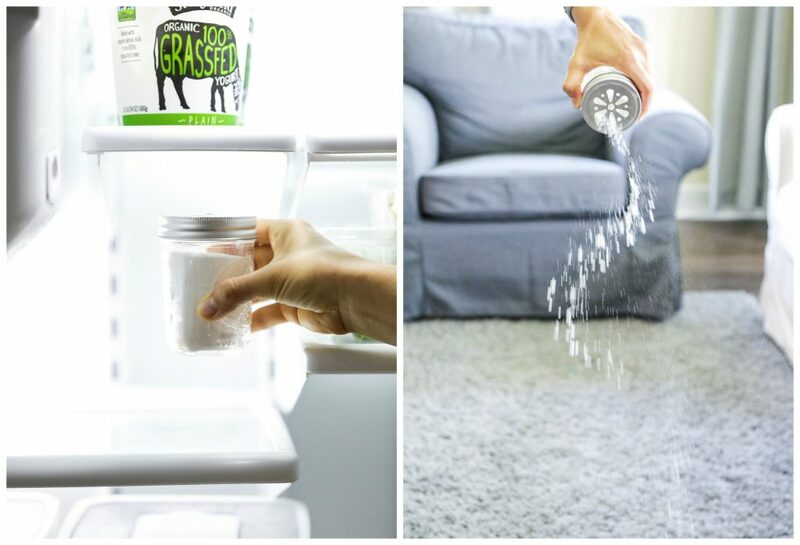 Store the container/mason jar in the fridge. After one month, dump the baking soda (or use it to clean your sink or toilet bowl), and create a new deodorizer. 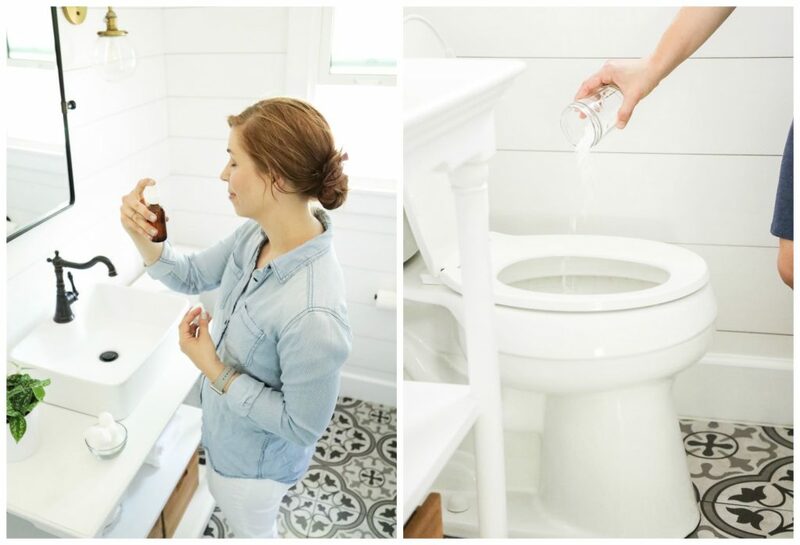 Generously sprinkle baking soda around the interior of the toilet bowl, wait 10 minutes, and then use a toilet brush to scrub away stains and odors. Sprinkle baking soda (you can mix it with a few drops of your favorite essential oil, if desired) on the bottom of a trash bin to keep odors away. Discard and refresh the baking soda every few weeks. If you don’t want to sprinkle baking soda in your trash can, sprinkle the powder in a small, short cardboard box first and then place the box in the bottom of your trash can. Sprinkle baking soda in your (stinky) sneakers, let it rest all night, and shake it out in the morning. The odor-neutralizing powder will naturally get rid of the stinky odor. Occasionally, I’ll add a few drops of essential oil to the baking soda, too. Thankfully, we’re past the scribbling-on-the-wall stage of parenting. In the past, when crayon marks were accidentally added to the wall decor, I would generously sprinkle a wet cloth with baking soda and then gently wipe the wall with the cloth until the crayon marks disappeared. Enameled Dutch ovens are my favorite pots to use for cooking. (I use Lodge Brand.) The pots can be used to make bread, soup, beans, poach chicken, or steam veggies. They’re also beautiful statement pieces. While the outside of the pots may look gorgeous, the insides can quickly go from white to brown (thanks to food, heat, etc). To clean the interior, I fill a pot with water (about 3/4 of the way full), add 1/3 cup of baking soda, bring the water and baking soda to a boil, and then turn off the heat. After about 30 minutes, I dump the dirty water, sprinkle the wet interior generously with more baking soda, scrub the surface with a textured sponge, and then rinse the interior with fresh water. 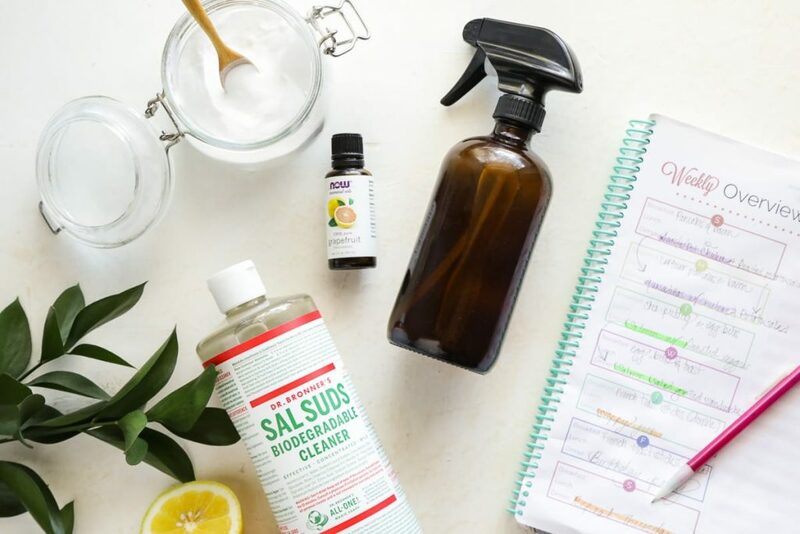 I love to use salt and a lemon to deodorize my wooden cutting boards, but that’s not the only simple formula that will deodorize a board. Sprinkle baking soda onto a wooden cutting board, scrub the baking soda over the surface, and rinse with fresh water. Sprinkle baking soda over the bottom surface of your oven, and then spray the surface (and baking soda) with water. Allow the wet baking soda to sit for a few hours, and then use a textured sponge to scrub away the build-up. Wipe the surface with a wet cloth, until the surface is clean. 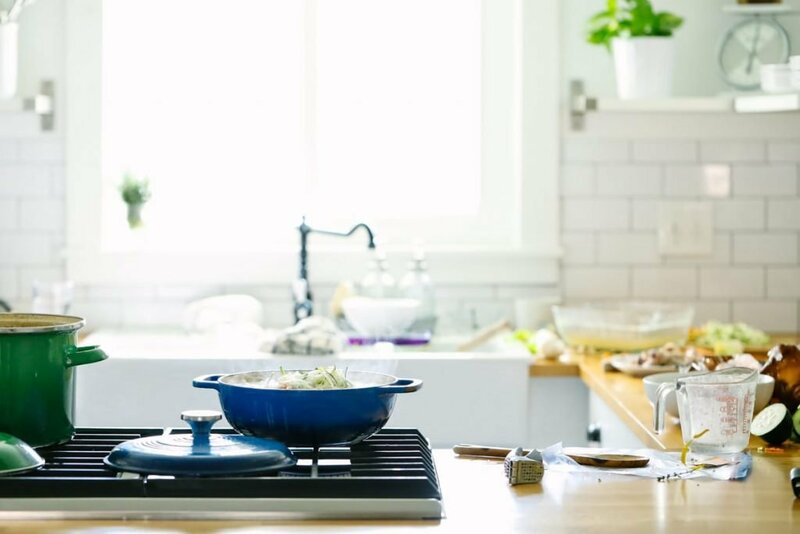 What’s your favorite way to use baking soda to clean, deodorize, or freshen your home? This might seem like a silly question but when are you adding the essential oil? Straight in the box or after you sprinkle? Hey Donna, I usually pour some baking soda into a jar and then whisk in the essential oil. You could add the oil directly to the box, too. I would like to tell you that I am the father of a son who is worth two, he always scratches the wall of the house, this tip that you give in paragraph 10 is only to floor in the wall or can be the wall painted to clean? Hey Ralfy, I’ve only done this trick on our painted wells. Don’t scrub hard–the paint could/will come off. And it will depend on the quality and gloss of the paint, too. Do you throw baking soda straight into the sink or dilute the water to wash? How much baking soda do you use to wash a sink? Hey Sue, I just sprinkle the surface (so the amount will depend on your sink), scrub it around with a sponge, and then rinse the surface with clean water. 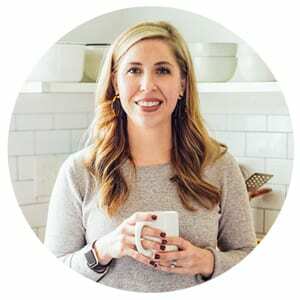 Thanks Kristin, I always feel more uplifted when my home is tidy and organized! Have a question about your bathroom. Very pretty. Love the tile and sink/ vanity. We are building a new home and am inspired by the decor in yours. Could I know where you got the sink/vanity? Thank you, Sandy! That’s so exciting–congrats! We purchased our sink and vanity from Wayfair. The vanity is actually a table and we just drilled a hole through it for the drain and mounted the sink on top. Hey Sarah, It works really well! It’s actually my favorite way to sprinkle baking soda over a surface. I purchase my set from Target a couple of years ago, but you can find them all over now. Our many uses have baking soda …… because now I know how I clean my house, I loved your tips !!!! Very good and creative … Success !! but is baking soda natural and safe .? another questin.what is it sal sud? what is the replace ?